We invite you on Thursday, June 30th, 2016 from 17 hours ( 5 PM) at our address of Wilrijk. You will have the opportunity to meet our students and teachers and to receive our guide of study 2016-2017. This day will also be the date of publication of Acta comparanda - III, 250 p. (old issues will be also available for 12€). 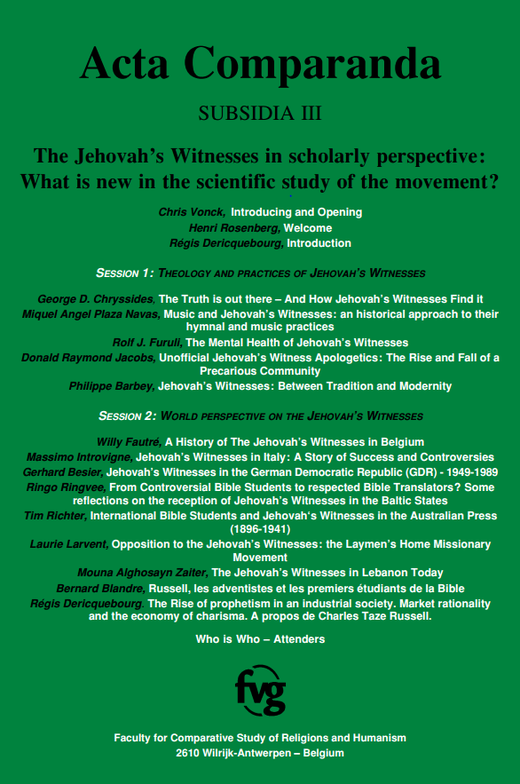 This issue is dedicated to the conference of April 21st and 22nd, 2016 entitled " Jehovah's Witnesses in scholarly perspective : What is new in the scientific study of the movement ". The Jehovah's Witnesses are especially known as people who do not hesitate to continue to evangelize. About their organization, about their theology, about their nonviolence, etc., we do not know much. The present publication is thus a very important lighting on what they are. More than 25 professors of Belgium and the foreign countries were present in Wilrijk to reflect about this subject and present their contribution. We shall read in particular in Subsidia III the studies of the professors G. Chryssides (United Kingdom), M. Introvigne (Italy), R. Dericquebourg (France), Miguel Angel Plaza (Spain), R.J. Furuli ( Norway), R.D. Jacobs (United Kingdom), PH. Barbey (France), W. Fautré (Belgium), G. Besier (Germany), R. (Estonia), T. Ringvee, T. Richter (Australia), L. Larvent (France), M.A. Zaiter (France), B. Blandre (France) and the foreword of one of our members, Dr H. Rosenberg.